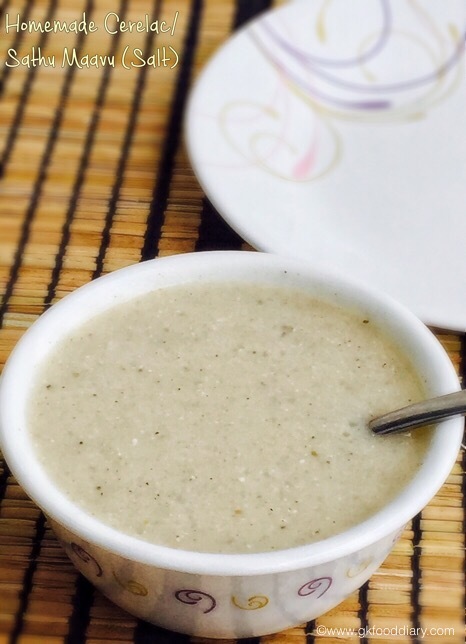 Homemade cerelac porridge or sathu maavu koozh is a healthy weight gaining food for babies. It can be done in jiffy when you have a stock of this homemade cerelac powder/sathu maavu. It’s a wholesome meal which keeps your baby’s tummy full for a long time. You can make either sweet or salty version as per your baby’s preference. My baby prefers sweet version over salt version. 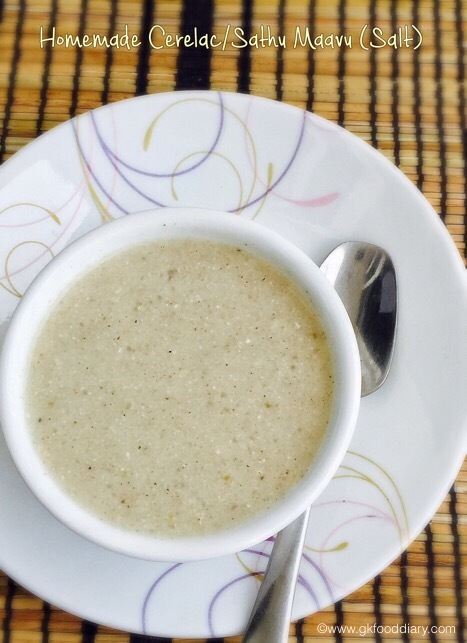 This homemade cerelac porridge can be given to babies of age 8 months plus. When you introduce this porridge to your baby for the first time, start with a tsp. Follow 3 days wait rule and if no allergic symptoms are seen, gradually increase the quantity. Please check the notes section for the points to consider before making this porridge to your baby. 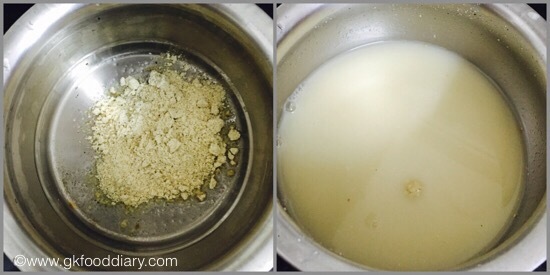 Here is how to make porridge with homemade cerelac powder/sathu maavu / health mix powder: sweet & salt version. 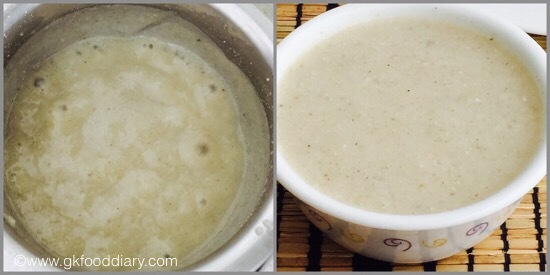 Homemade Cerelac Porridge - Healthy homemade cerelac or multigrain porridge (sweet and salt) for babies using homemade cerelac powder/sathu maavu. Boil milk (if using) in a sauce pan and keep it ready. Take 2 tbsp of homemade cerelac powder in a saucepan. 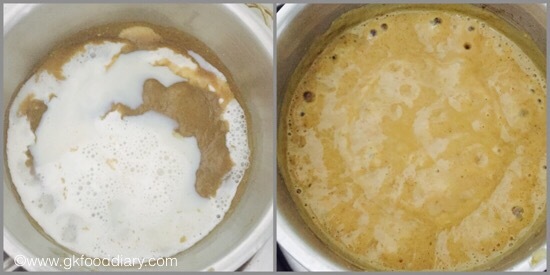 In another cooking vessel, add 1/4 cup of water to the powdered jaggery and boil until it melts completely. Then filter out the jaggery water using a strainer. 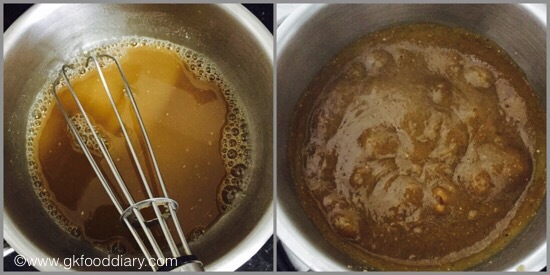 Add the jaggery water to the sauce pan along with ½ cup of water. Whisk it well without any lumps. Cook the porridge in medium low flame until the colour of the porridge changed to brown and shiny. Keep stirring while cooking. This may take 5-7 minutes. Now add ½ cup of milk (Skip adding milk if you are preparing this porridge for a baby under one year ) to the sauce pan and mix everything slowly with a whisk. Boil the porridge in low medium flame. Stir it continuously while cooking otherwise porridge may stick to the vessel. Boil the porridge until it becomes thick. Remove from the flame once done and cool it down. The porridge becomes thick after cooling down. So switch off the flame accordingly. Take 2 tbsp of homemade cerelac powder or sathu maavu in a saucepan and add ¾ cup of water along with salt and jeera powder. Whisk it well without any lumps. Heat it up and cook it with continuous stirring. Cook the porridge in medium low flame until the porridge gets cooked completely shiny. Keep stirring while cooking. This may take 5-7 minutes. Once it becomes shiny and thick, switch off the flame and let it cool down. Finally add buttermilk to the porridge and mix well. 2. Boil milk (if using) in a sauce pan and keep it ready. 1. Take 2 tbsp of homemade cerelac powder in a saucepan. In another cooking vessel, add 1/4 cup of water to the powdered jaggery and boil until it melts completely. 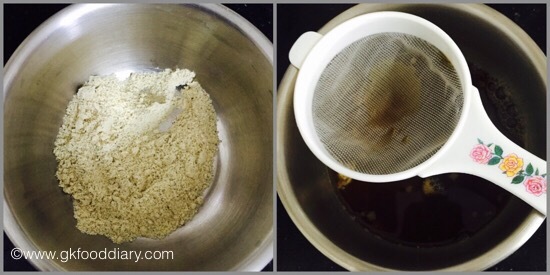 Then filter out the jaggery water using a strainer. 2. Add the jaggery water to the sauce pan along with 1/2 cup of water. Whisk it well without any lumps. Cook the porridge in medium low flame until the colour of the porridge changed to brown and shiny. Keep stirring while cooking. This may take 5-7 minutes. 3. Now add 1/2 cup of milk (Skip adding milk if you are preparing this porridge for a baby under one year ) to the sauce pan and mix everything slowly with a whisk. Boil the porridge in low medium flame. Stir it continuously while cooking otherwise porridge may stick to the vessel. Boil the porridge until it becomes thick. Remove from the flame once done and cool it down. The porridge becomes thick after cooling down. So switch off the flame accordingly. 1. Take 2 tbsp of homemade cerelac powder or sathu maavu in a saucepan and add 3/4 cup of water along with salt and jeera powder. Whisk it well without any lumps. Heat it up and cook it with continuous stirring. 2. Cook the porridge in medium low flame until the porridge gets cooked completely shiny. Keep stirring while cooking. This may take 5-7 minutes. Once it becomes shiny and thick, switch off the flame and let it cool down. Finally add buttermilk to the porridge and mix well. 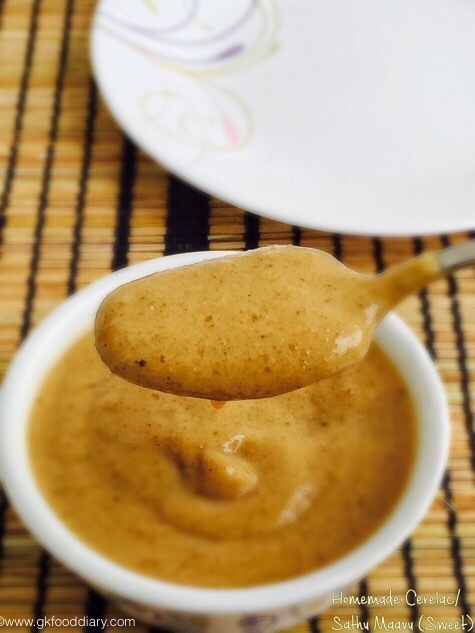 Healthy homemade cerelac porridge/Sathu Maavu kanji is ready to feed your baby. Instead of jaggery, palm sugar can be used. Use heavy bottom vessel and stir continuously while cooking. Otherwise the porridge will stick to the bottom and lumps will be formed. Adjust the consistency of the porridge as per your preference. Add butter milk to the porridge only after the porridge cooled down completely. Skip milk if your baby is under a year old. Adding salt is not recommended for babies below one year. I use 24 mantra organic jaggery powder for my baby porridge’s. 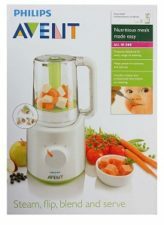 Increase the water quantity to 1 cup and make the porridge watery when you are introducing this porridge to your baby. Offer this porridge plain when you start. Try to avoid jaggery/ palm sugar/ palm jaggery or any kind of sweetener at least till one year, Add very little amount than mentioned or prefer sweet tasting fruits/vegetables like apple, banana, carrot etc or dry fruits like dates or raisins. I am very much delighted to hear this. Thanks for letting me know. Keep visiting ? Nice. 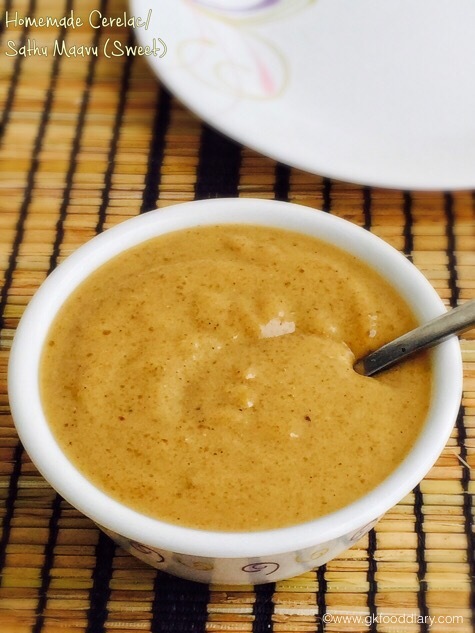 But can you share recipe for preparing sattu mava at home. Thanks. I have given the link above to make powder. Can this be given in the evening at round 6? For 16 month baby how much power should we use… I'm using a spoon which comes with ceralac pack.. Im taking 2 spoons.. Will the be sufficient? Yes that should be sufficient. Can i feed this twice a day. What is the quantity to be fed at a time to my 1 year old son. Can i feed this cerelac twice a day to my 1 year baby. For rice,ragi,green gram porridge…shall I provide the porridge without adding buttermilk … or is it necessary to add ..